AMAZING DEALS On The 2019 Versa In TX! It’s not easy to become an icon – but that’s just what the Toyota Camry has managed to do. A longtime driver favorite, the Camry holds its own in a crowded and popular class of vehicles and sets the bar high for other midsize sedans. Not only is the Camry extraordinarily well equipped and practical, as you would expect from a car that serves primarily as a family transportation vehicle, it is also fun to drive and packed with cutting-edge technology features. And following its full-scale redesign for the 2018 model year, the Camry boasts something not often associated with midsize sedans: bold and sporty style. For 2019, Toyota has enhanced the Camry’s offerings with newly standard Apple CarPlay. It joins a host of other entertainment and connectivity features to ensure that the latest Camry doesn’t just meet but exceeds expectations. The 2019 Camry is available in five distinct trims, plus a Hybrid variation. Among the L, LE, SE, XLE, and XSE trims, you’ll find such premium options as leather upholstery, wireless smartphone charging, a JBL audio system, and a panoramic glass roof. And with the Camry’s value-forward price tag, you can select the trim that provides everything you want out of your family sedan without breaking the bank. That’s especially true when you buy or lease your Camry from Toyota of DeKalb. Our Sycamore-area dealership is fully stocked with all the new Toyota models you love, including many versions of the beloved Camry. Take some time to browse our inventory online and find the models you’d like to take a closer look at. Then, when you’re ready to explore them in person, visit our conveniently located dealership and get ready for some exciting test drives of your favorites! You’re bound to love the Camry – not to mention the prices we have to offer. Continuing the enhancements that were introduced in last year’s redesign, the Camry’s cabin is indulgently spacious and comfortable. High-quality, soft-touch materials and supportive seats invite occupants to sit back and enjoy the ride. Making it even easier to do just that is the extensive array of top-notch technology features that are on hand to bolster entertainment, connectivity, convenience, and comfort. When it comes to safety, the Camry has you covered with a large selection of standard safety equipment including adaptive cruise control, forward collision warning, lane keep assist, pedestrian detection, and more. The Camry handles like a dream and delivers more-than-ample power, while remaining incredibly fuel efficient. The base engine is a 203-horsepower 4-cylinder, and there is also an available 301-horsepower V6. No matter what’s powering your Camry, you can look forward to a consistently smooth and composed ride quality. Why Buy or Lease a Camry from Toyota of DeKalb? If you’re wondering why so many of your friends and neighbors rave about Toyota of DeKalb, then one visit to our dealership will show you. 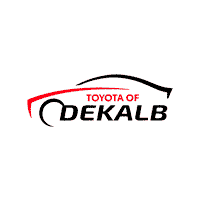 Enjoy the best car shopping experience you’ve ever had when you make Toyota of DeKalb your dealership of choice. We’re known for our selection, prices, and service, so stop by today and put us to the test. We can’t wait to help you purchase or lease your dream car for an incredible price or monthly payments.